The London theatres arguably were the central cultural institutions in England during the Romantic period, and certainly were arenas in which key issues of the time were contested. 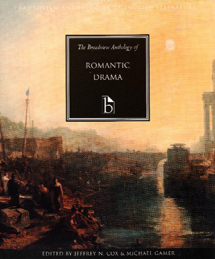 While existing anthologies of Romantic drama have focused almost exclusively on "closet dramas" rarely performed on stage, The Broadview Anthology of Romantic Drama instead provides a broad sampling of works representative of the full range of the drama of the period. It includes the dramatic work of canonical Romantic poets (Samuel Coleridge's Remorse, Percy Shelley's The Cenci, and Lord Byron's Sardanapalus) and important plays by women dramatists (Hannah Cowley's A Bold Stroke for a Husband, Elizabeth Inchbald's Every One Has His Fault, and Joanna Baillie's Orra). It also provides a selection of popular theatrical genres—from melodrama and pantomime to hippodrama and parody—most popular in the period, featuring plays by George Colman the Younger, Thomas John Dibdin, and Matthew Gregory Lewis. In short, this is the most wide-ranging and comprehensive anthology of Romantic drama ever published. The introduction by the editors provides an informative overview of the drama and stage practices of the Romantic Period. The anthology also provides copious supplementary materials, including an Appendix of reviews and contemporary essays on the theater, a Glossary of Actors and Actresses, and a guide to further reading. Each of the ten plays has been fully edited and annotated.